The charming boutique style Clarion Collection Hotel Mayfair is in the heart of Copenhagen City Centre, surrounded by some of Copenhagen’s most exciting shops, bars and restaurants. It is just a short walk to Tivoli Garden, Town Square and the Central Train Station and within easy reach of the Airport and Bella Conference Centre. Oozing with style and comfort all 106 rooms are designed by leading Scandinavian designers. 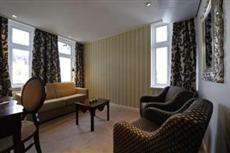 The 4 suites contain a whole new definition of glamour including luxurious fabrics and state of the art technology. Enjoy a wine tasting experience in our cosy lounge with log fireplace which is the perfect setting to wind down after a busy day in Copenhagen. A full scale renovation, completed in early 2008 renders this hotel as one of a kind. With a home like and laid back atmosphere it still provides all the facilities expected by today’s modern traveller. The hotel provides free wireless internet throughout the whole hotel, a guest PC is available in the lobby. All rooms include breakfast and our evening buffet, a light buffet served every evening between 18:00 and 21:00. We also offer free coffee, tea and fruit during the day.